This medical walker was used after spinal surgery. I still have it after a long, arduous recovery. Part of me believes that I am hanging onto it in case "I need it again". But that would be accepting that the recovery wasn't successful, so away it goes. The recovery was successful, so I am letting go of its old energies. Method of release - SRS released this medical walker by using it as a platform for a series of subtle acrobatics and movements. 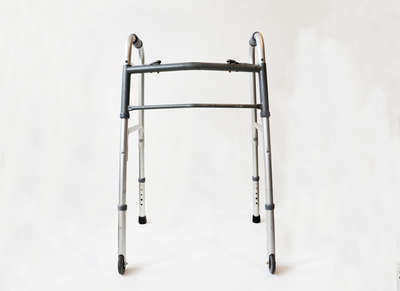 After the walker falls from its bamboo perch, it will be donated to someone who needs it.